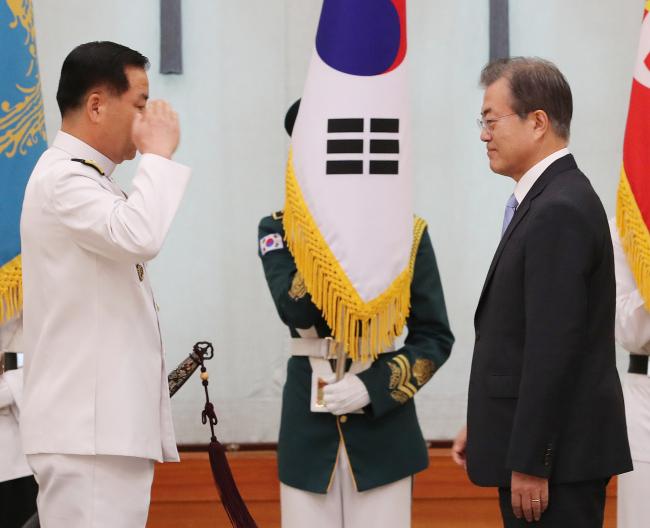 President Moon Jae-in on Thursday swore in Adm. Sim Seung-seob as the new head of the Navy, raising him from the rank of vice admiral. Sim replaces Adm. Um Hyun-seong as chief of naval operations. The new Navy chief had headed the Chief Directorate of Strategic Planning of the Joint Chiefs of Staff. Sim graduated from the Korea Naval Academy, and served in a number of key positions within the Navy before serving with the Joint Chiefs of Staff. Posts Sim held include the head of the Navy’s personnel management and that of the Navy’s tactical intelligence department. Sim also served as the commander of the 1st Fleet. “He is an admiral with insight into diverse range of posts, and an expert in naval and combined operations,” the Ministry of National Defense said in a press release, citing the various posts Sim held in his career.